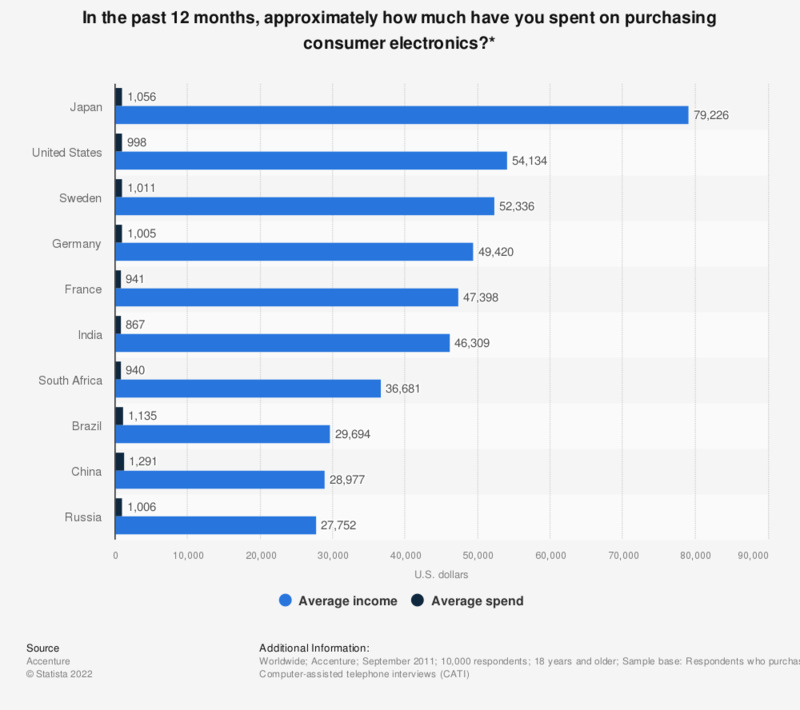 This statistic illustrates how much money respondents spent on consumer electronics in selected countries worldwide in the 12 months preceding September 2011, compared to the average income in their country. According to the survey, consumers in Sweden spent 1,011 U.S. dollars on average in this period, amounting to 1.9% of the average income in their country (52,336 U.S. dollars). The 2012 Consumer Electronics Report is based on a September 2011 survey of more than 10,000 consumers across 10 countries. The countries include; Brazil, China, France, Germany, India, Japan, Russia, South Africa, Sweden, and the United States. 1,000 respondents were surveyed in each country. * During the survey, this question was posed as follows: "In the past 12 months, approximately how much have you spent on purchasing consumer electronics, such as the ones listed above?"